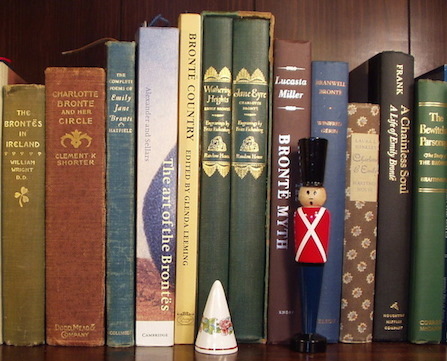 My first encounter with the Brontës occurred in the late 1990’s when visiting a bookshop offering a going-out-of -business sale. Several books previously declined were revisited because of price markdowns. One of these, Gooberz, a work with a twin souls theme by Linda Goodman (author of Sun Signs and Love Signs) explored again. Even with a discount, this book I decided, isn’t not for me. Suddenly a peak experience occurred during page turning in it. Words printed on a preface page electrified me! There I read “But this I know: the writer who possesses the creative gift owns something of which he is not always master – something that, at times, strangely wills and works for itself.” Charlotte Brontë. This text, I later learned came from Charlotte Brontë’s “Editor’s Preface to the New Edition of Wuthering Heights” – an 1850 edition of Emily Brontë’s novel published by Smith, Elder & Company, London. Charlotte’s “Editor’s Preface” attempted to exonerate, to explain how her sister, Emily – a simple soul – came to write such a dark, violent work as Wuthering Heights. This entry was posted in Uncategorized on June 23, 2014 by bronteusa. Hi Jo–enjoyed your comments. I met Jo while a new member of the Bronte Society many years ago. I wrote to the Bronte Society and told them how I wished I could meet all the Bronte Society members at the gatherings in Haworth. They sent me Jo’s name. She lived just up the road from where I live and I wrote to her and she wrote back and we have been friends for many years. In regards to ” How I met the Brontes’ –I was a young newlywed and living in Southwest Virginia and went to the library there one day and came across Mrs. Gaskell’s infamous biography The Life of Charlotte Bronte. After I read the book I had such a strong admiration for Charlotte. She is still my favorite of the sisters even after all these years. I first met the Brontes in high school when I pulled from the library shelf the Random House edition of Wuthering Heights. On first opening the volume, I came face to face with those weird wonderful woodcuts of Fritz Eichenberg https://www.google.com/search?q=fritz+eichenberg,+images&biw=1280&bih=855&tbm=isch&tbo=u&source=univ&sa=X&ei=JEQ9VMmJEtT_yQTOo4C4Dg&ved=0CB0QsAQ. He literally pulled me into the novel and I quickly learned that the Emily Bronte/Fritz Eichenberg team was a match made in Heaven! Through the years I have re-read WH many times but never with the impact of that first encounter in the school library. Hello Randall. I was surprised to learn that you became a devotee as late as the late nineties. In my eyes you are a newcomer. I first read “Jane Eyre” in June, 1947 and have been a Bronte lover ever since. I’ve read all three sisters’ books many times over and never tire of them. I have read and continue to read everything about them. I’ve seen just about all of the available film and tv versions. I’ve been to Haworth four times: twice for the annual meetings and twice as a visitor. I became a life member of the Bronte society in the early seventies. The parsonage library has an article of mine on Emily Bronte and George Sand. The Bronte novels, especially Charlotte’s, have been a source not only of pleasure but also of comfort and consolation. I can’t imagine my life without them.